Although one can find references to the area of the Porziuncola in the documents of the city of Assisi dating back to more or less the year one thousand, it is only with the life of Saint Francesco that the place acquires its precise identity, being a religious centre for the Order of the "Frati Minori" (Minor Friars) as well as an important destination for the pilgrims. 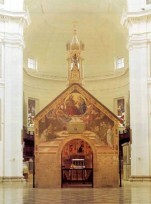 After having abandoned the wealth of his family Saint Francesco found asylum in this old chapel, nowadays located inside the large Basilica of Santa Maria degli Angeli, he restored it and obtained it as a gift from the Benedictines. In this place, on March 28th 1211 after Christ Chiara di Favarone di Offreduccio began her monastic life, founding then the Order of the Clarisse and Saint Francesco obtained from Jesus during a dream the indulgence of the Forgiveness. Already before the building of the Basilica of Santa Maria degli Angeli, the visitors coming to the Porziuncola were so numerous, even estimated to 100000 in 1582 after Christ, that it was becoming necessary to have new structures to welcome them. For example, in 1450 after Christ Cosimo dei Medici absolutely wants the building of the "fontain of the 26 cinnamons" that nowadays is located along the side of the basilica. The structure of the Porziuncola is a copy of the typical organization of the Benedictine structures in the Umbrian roman style; the church, made of squared rocks, has remained untouched at the exception of the small belfry - tabernacle of gothic inspiration, of a painted door dating back to the end of 400 and of the façade almost completely recovered of frescos by Federico Overbek in 1830 after Christ.The interventions of restoration in del 1998 have allowed to avoid an ulterior degradation of the chapel and to get back the painted materials of the great politico behind the altar painted in 1393 after Christ by Ilario da Viterbo, as well as some rests of the frescoes of the Crucifixion in the apsidal part realized around 1485 after Christ by the Perugino.